I had friends over on Sunday and by request, made a garden fresh entrée. The advantage with this type of dinner is, it is quick and easy to prepare while guests are there. We had pleasant conversation as I put it together, which from start to finish was less than 20 minutes. I apologize in advance, I have no photos of the final dish because I was having such a good time I completely forgot to even get my camera out. Blend 4 tomatoes and 4 basil leaves together until smooth and add to saucepan. Bring to a boil, reduce heat and let simmer while prepping the remainder of the dinner. In large pot, cook pasta according to package directions, to al dente. Drain, but don’t rinse. In skillet, heat 1 tbsp of oil, add onions. Saute for a minute and then add peppers. Stir occasionally until they are softened and onions are translucent. Add additional tbsp of oil, once heated, add garlic, zucchini and eggplant. Saute until tender. Finally, add tomatoes and basil, cook for one to two minutes and then add the tomato mixture from the saucepan. Stir together gently and bring to a low boil for about 1 minute. Serve over pasta. Go wild and add whatever fall garden vegetables you have on hand…. After asking for and receiving some excellent advice on how to use my new convection oven, I decided to jump in and test it out. 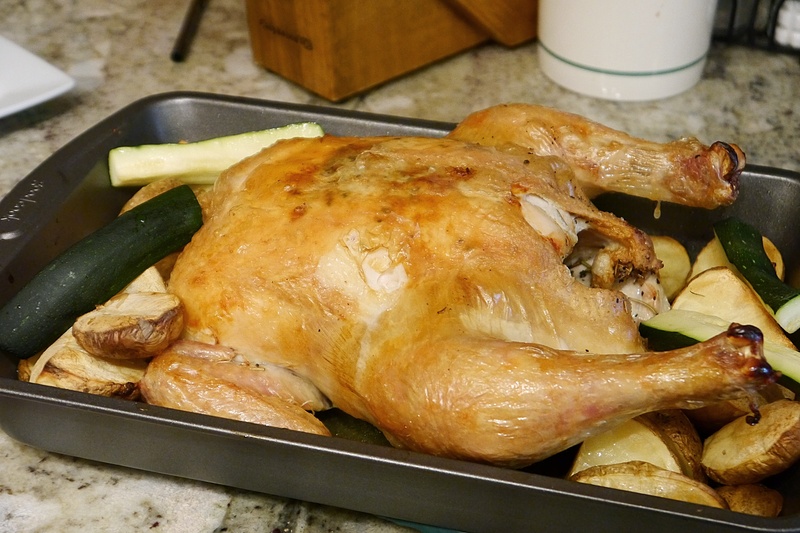 Roasting a chicken seemed like the most logical choice. If I ruined it, I could turn it into chicken salad. Sonoma Chicken Salad to be exact, found here. This time of year, recipes seem superfluous – farm fresh corn, zucchini from my garden and sliced tomatoes need little embellishment. But I do have Tomato-Pasta Salad, here, that changes up the usual flavors. For dessert, those plums needed to be used, so I went with a Plum Crumble (or as my cousin christened it, Plumble), recipe here. I used the convection feature, which helped the crisp brown evenly. Bonus Bixby inspecting the plums here. 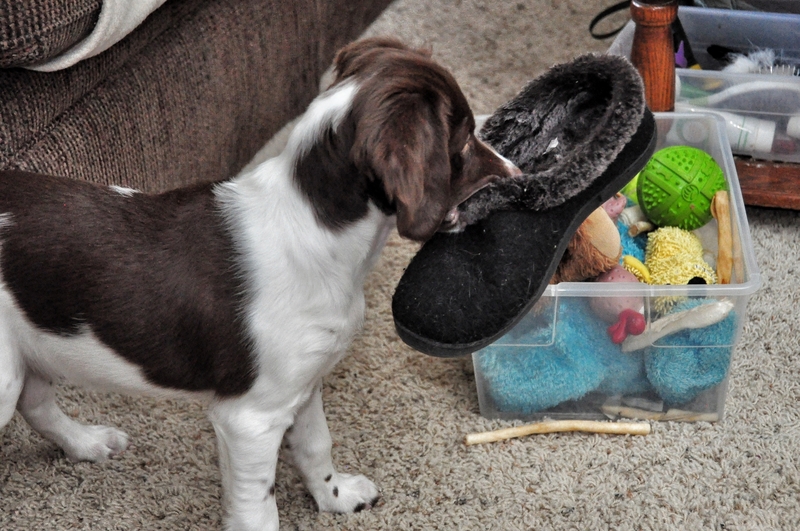 That’s the most adorable, Gabe, getting himself into a bit of trouble. I am looking forward to seeing how JeffreyW’s figs turn out, hopefully abundant enough for homemade fig newtons. But if not, just fresh off the tree. I love figs! Photos of his fig progression are here. What’s on your menu this weekend as summer winds down? My grapes are starting to ripen, and of course I’m overrun with plums, so does anyone have some good plum or concord grape recipes they want to share? What else is cookin’ tonight? 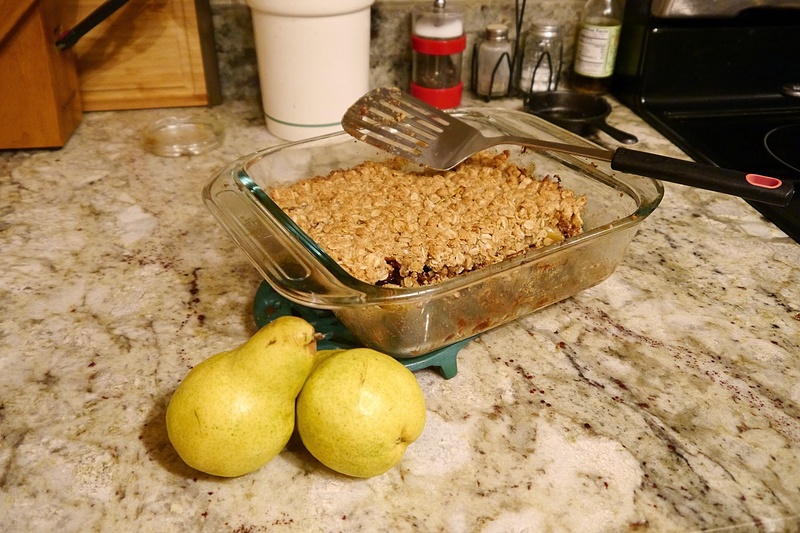 Tonight’s featured recipe is pretty simple, since what I wanted was to test out how the convection oven treated my ingredients. 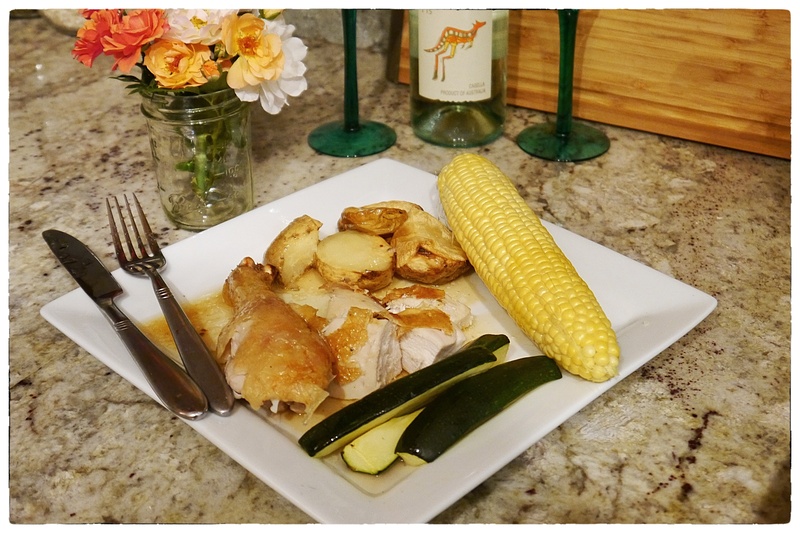 I started with a local chicken, zucchini from my garden, potatoes from my dad’s garden and local corn. I mixed together 2 tbsps of butter with dried, crushed rosemary and basil, along with crushed garlic and rubbed it under and over the skin of the chicken. I then rubbed more of the herbs and garlic inside the cavity. 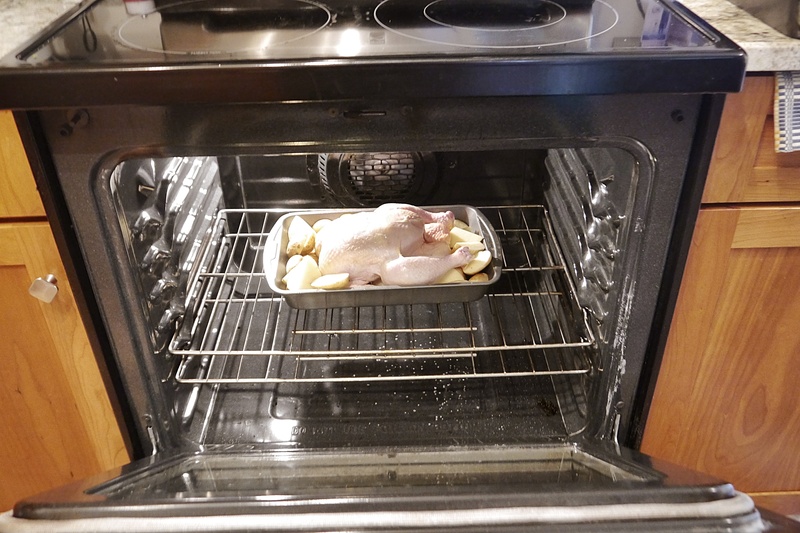 I put the chicken and the sliced potatoes into the roasting pan. I roasted them at 425 degrees, until the breast meat registered at 165 degrees and the thighs at 170 degrees. The high temperature, combined with the convection created a crisp skin that quickly sealed in the juices. Total cooking time was one hour for a five pound bird. I added the sliced zucchini about 15 minutes before the chicken was about to come out of the oven, so everything finished up nicely. The corn was microwaved for two minutes an ear (for a total of six minutes) with the husks on. If I had been more confident with my oven skills, I would have popped the ears into the oven just a bit before the zucchini and roasted them in the husks. 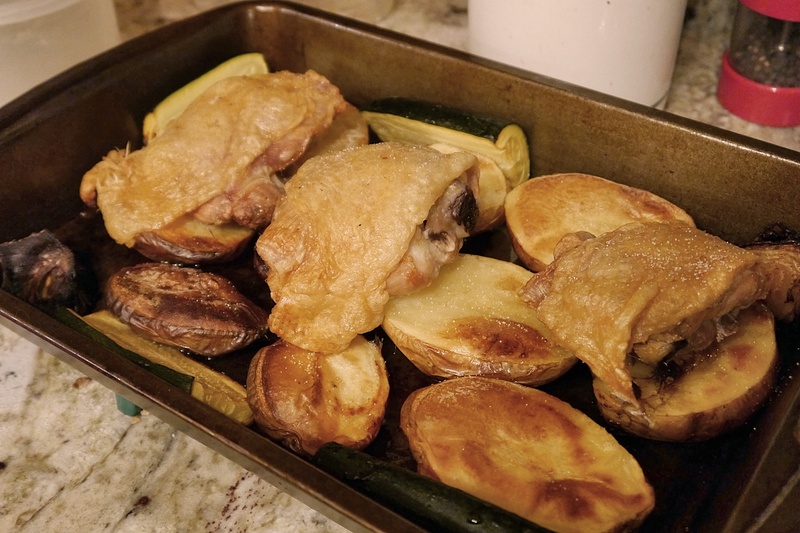 I am over the moon with what the convection feature can do – the potatoes were perfectly roasted, the chicken crisp and moist, the zucchini tender. The flavors were great and the herbs really permeated the meat. And…we’re back. Tonight’s recipe exchange is going to focus on quick and fresh. This is as quick as it gets. Cook linguine according to package directions. While it cooks, heat oil in skillet over medium heat, add onions and saute until translucent. Add garlic and vegetables, stirring until tender-crisp. Stir in tomatoes, basil and cook until heated through. Drain pasta and add to skillet, tossing well. Top with Parmesan cheese. Just finished giving the Beast a bath. He hasn’t been in the tub all summer because he loves sprinklers, his pool and my neighbor hosing him down. The first thing I noticed: he’s grown. I’ll post pictures later. Keeping in the vegetarian theme, here is this week’s dinner menu. Mix together dressing and refrigerate. In saucepan, cook pasta according to package directions, drain, rinse in cold water and toss with ice cubes. Set aside and let cubes melt. While pasta is cooking, in skillet, heat oil and sauté eggplant, mushrooms and zucchini until tender. Remove and cool in refrigerator while preparing remaining vegetables. In bowl, toss all vegetables with dressing. Remove any un-melted ice cubes from pasta, and toss with vegetables, refrigerate 10 minutes. Add cheese. 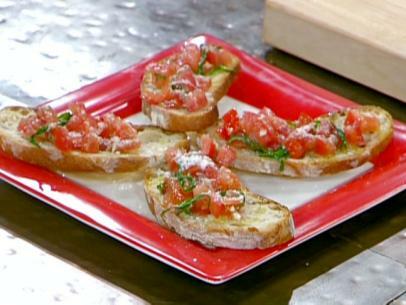 Gently toss 1 tbsp of olive oil, 1 tsp crushed garlic, basil, tomatoes and green onions and set aside. Mix togethere 1 tbsp oil and 1 tsp garlic. Spread on sliced sides of bread. Broil bread until golden brown on top (watch carefully). Layer tomato mixture on each half of the bread and then slice each half into quarters or eighths. I thought we’d send summer out with a bang and do a spicy grilled mix and some fruit cobbler. 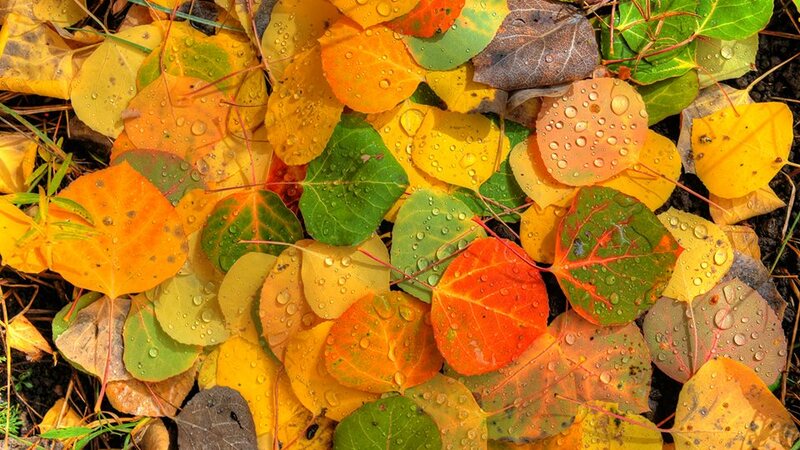 I am a summer worshiper and I mourn its passing. Let’s have a moment of silen…okay, done now. Bring on the fall foods! It was cool enough today that I was actually thinking of soup. Chicken Tortilla Soup and Sweet Pepper Potato Soup (recipe coming up soon). Going old school tonight. I thought you may still have some zucchini and tomatoes that needed to be used up and this menu does both. Growing up, spaghetti was a weekly occurrence. I’m not sure where my mom learned to make it, because it is my dad’s half of the family that is Italian, but it was always a hit at our house. Over the years we’ve all played with different variations, but this is pretty close to the original. Whether it was at a weekly family meal or the Christmas dinner at my Gram’s, this basic sauce ruled. And the good thing is, it is simple to modify depending on your tastes. If you want to spice things up, add 1/4 to 1/2 lb of spicy Italian sausage and reduce the ground beef by as much. Quick, easy and freezes well, I usually make double so I have some on hand for quick dinners. Trust me, you will never find any jar sauce in my house. Ever. 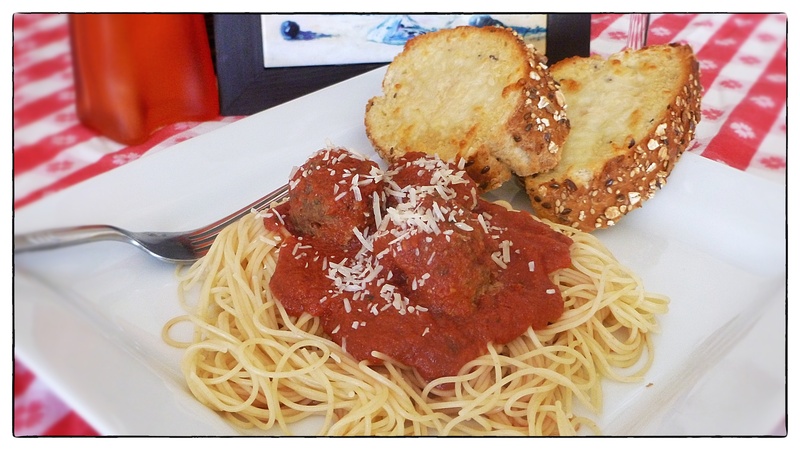 If you’d like to have meatballs instead, recipe is here. In skillet, heat oil, sauté pepper, onion, garlic. Add hamburger and cook thoroughly. Add tomato paste and 1 tsp ea of crushed basil, oregano and rosemary, mix well. In saucepan, add remaining ingredients and bring to a low boil, reduce heat, add meat mixture and let simmer for 30 minutes. Clean and slice zucchini, heat oil in skillet, add zucchini, garlic and spices. Stir-fry over medium heat, add 1 tablespoon water and let steam until zucchini is tender. Toss with parmesan and serve. *CRUSHING Spices – when using dry spices, to get the best flavor, you should crush them, either by rubbing them in your hand or using a mortar and pestle before adding them to a recipe. JeffreyW makes an easy pasta salad. Just toss garden veggies and pasta with a little olive oi, vinegar and herbs. Dinner’s done. In my email this morning there was a nice recipe for pasta salad and suddenly I had a craving for a veggie filled summer pasta salad. Pasta salads can be served cold, warm or hot, depending on what you’re looking for and what style of ingredients are added. 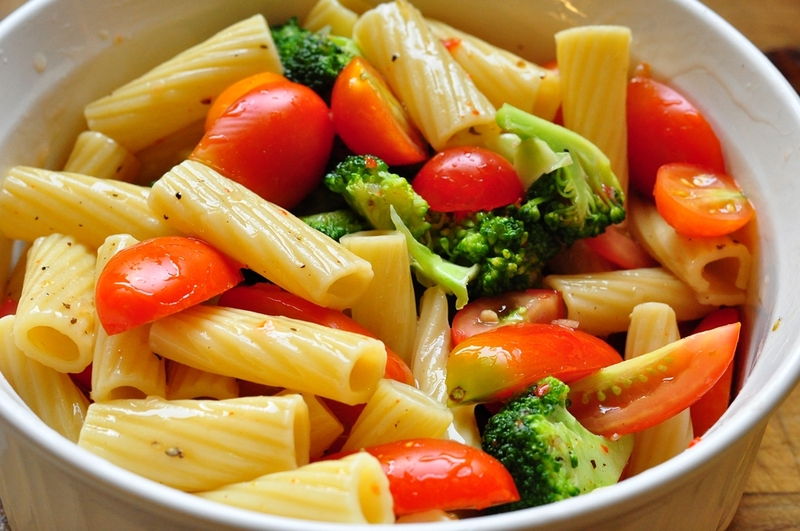 The featured recipe tonight is a warm pasta salad using garden fresh vegetables and melted cheese. I live within walking distance of a great cheese shop, it has an entire room that is basically a walk-in refrigerator. They even lend you jackets to wear while shopping. It’s fun to stop by there on a hot summer day and spend a half hour in the fridge and sample cheese from around the world and from local farms. I think I’ll see if they can help me identify or duplicate the cheese. Side note: I’ll miss everything that is within walking distance when I move. Right now I live near downtown and can walk to bank, post office and any number of great restaurants. But it’s the trade off for more space and a functional bike path. First up, Chipotle Macaroni Salad (recipe here), which takes cold pasta salad up a notch and has become my go-to cookout salad. One of the keys when making a good cold pasta salad is to cook the pasta al dente, drain, rinse with cold water to stop the cooking process and then drain again, but let the pasta stay wet. This allows the pasta to absorb whatever flavors are added, but not absorb all the moisture from the dressing. Don’t toss with dressing until just before serving. Taking these steps will keep the salad moist and flavorful, avoiding the mushy pasta, dry salad problem that makes many pasta salads unappetizing. Not excited about pasta? How about a nice Italian Lentil Salad (here) or a tangy Apple Salad (here). 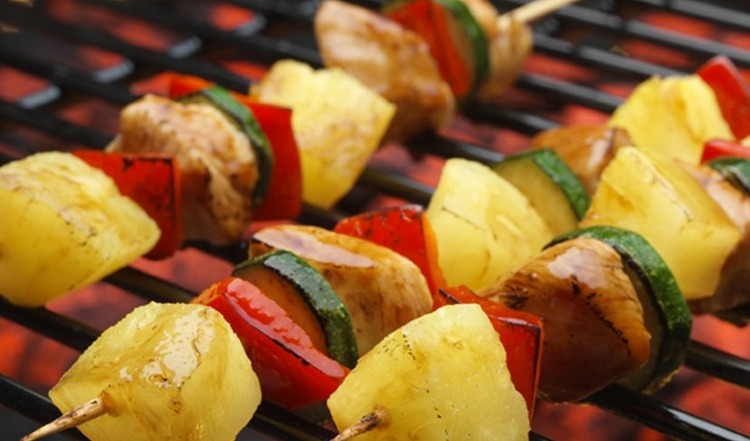 What’s on your menu for the first day of summer? Have any favorite salad recipes (pasta or otherwise)? I am crazy about salads, so would love to have a few new varitions to add to my recipe box. Tonight’s featured recipe is adapted from an American Test Kitchen recipe. I’d link to the original, but it’s behind a firewall. Sorry for that. The beauty of this recipe is you can substitute whatever vegetables are fresh and available. 5 ounce package Garlic & Herb Boursin cheese – or any creamy cheese, flavored or you can add your own fresh herbs to it instead – I actually used the cheddar mentioned above because it melts so well, and is really creamy, not like typical cheddar. Bring 4 quarts water to boil in Dutch oven. Add pasta to the boiling water and cook until al dente (this is a still chewy texture). Reserve 3/4 cup pasta cooking water and drain pasta (the easiest way to do this is to ladle pasta water into a measuring cup and then drain the remaining water). Wipe out the pan, add oil and heat over medium-high heat until shimmering. Add onion and cook until softened, about 3 minutes. Add garlic and cook about 30 seconds. Add zucchini, summer squash, and ¼ cup reserved pasta water and cook, covered, until vegetables are tender, about 6 minutes. Stir in cooked pasta, and cheese, remaining 1/2 cup pasta water, tomatoes and basil until pasta is heated through. Season with salt and pepper to taste. Serve with grated Parmesan. Serves 4.